That was one great result. 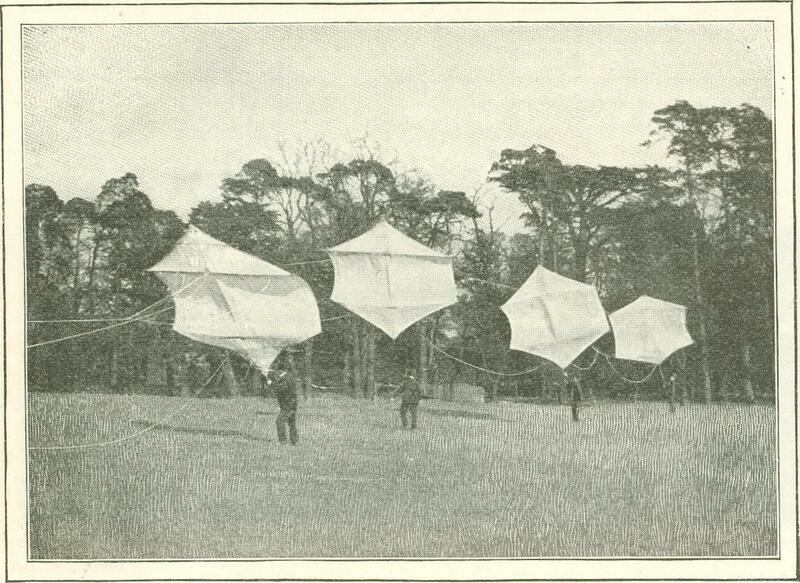 I went on improving details, but made no important step until March, 1893, when, after trying a great many unsatisfactory arrangements for steering the kite out of the wind course, I hit upon the plan of having two flying lines, one on each side of the center. In this way, I found, I could not Only steer my kite to a remarkable extent on either side of the wind course; but in a gusty, variable wind, I could, by fastening the two lines at a dis­tance apart, keep the kite floating perfectly steady. I then returned to weight-lifting. After many trials, I was one day de­lighted to get a kite of about one hundred square feet to lift a weight of fifty-six pounds clear off the ground. 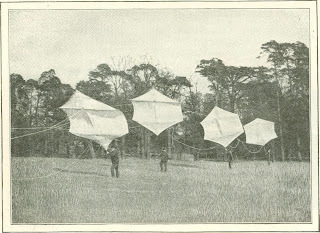 I now made the kites bigger and bigger until, in May, 1894, I had a huge contrivance of bamboo and canvas, thirty-six feet high, with an area of about 500 square feet. To get a sail maker to piece together the lightest can­vas for the cover was easy enough, but how to make the frame was the difficulty. To calculate the strain would be a very nice way to begin, but what wind was I to allow for? If I made provision for a gale my ap­paratus would weigh so much that no light breeze could lift it. So I began the other way. I got some light bamboos, lashed them together, and stretched the canvas on the framework. It rose majestically, quietly doubled up and collapsed, and sank to the ground a wreck. So I made a stronger framework, and sent the kite up by two cords, with a basket sus­pended between them: the same device as that shown in the two pictures on this page. The result was satisfactory as far as it went, but that wasn't far. I smashed dol­lars' and dollars' worth of bamboo. Again and again, when I thought I had made a really good piece of apparatus, some little detail would go wrong ; the kite would rise up in the wind, turn sideways, and come plump down against the ground, smashing every bone in its body. To me it was heart-rending to see, but to mere spectators it proved most enter­taining. They roared with laugh­ter. However, we progressed; and so satisfactory did our work at last become that one day - it was June 27, 1894 - we de­cided on putting it to the crucial test. The ques­tion, not so much with me, for I was very confident, but with the assistants and lookers-on, was, "Will it lift a man?" The weather was not favorable. The wind came and went: a strong puff, and then a lull. As it seemed so light, I was kind enough to allow my youngest and lightest brother officer to take the seat of honor in the basket, and see if he could be lifted. 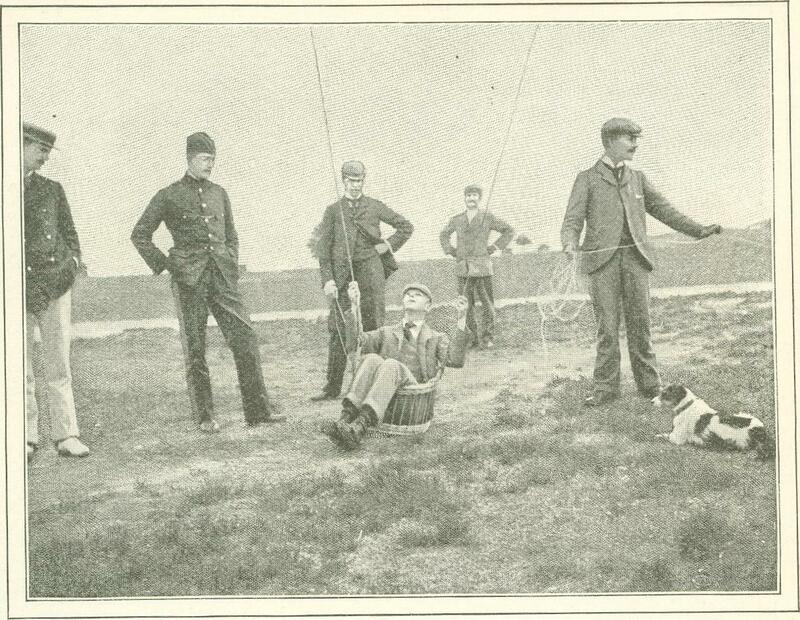 The kite was mean­while flying perhaps fifty feet overhead. Suddenly the wind freshened. There was a creak of the basket, and up it went, man and all, while we retained hold of the cords to prevent his being carried too high. My machine had really lifted a man. I then got into the basket. It lifted me, too! Again we persevered, and gradually the kite improved and grew more tractable. I now found that numerous difficulties arose from having so big an apparatus, not the least being that it proved much too powerful in a strong wind. So I returned to smaller kites, and fixed several together, their num­ber depending on the wind force. I had come to the conclusion that the best shape, considering lightness, convenience of folding up, power to lift, and ease of mak­ing, was one in which the frame consisted of three poles of equal length, one placed up­right and called the "backbone," the other two put across the "backbone" at right angles, at a distance from either end of it equal to about one-sixth of its length. The shape was thus nearly hexagonal. This form, for want of a better name, I chris­tened "Levitor." The most convenient size was that in which poles not more than twelve feet long were used. This made the area of the kite about 120 square feet. From just lifting a man, I got to lifting him easily. Once a kite takes hold of a man, it may lift him to any height. If it was capable of lifting a man during the puffs ten or twelve feet (in the intervals letting him down with a bump), why not 300 or 400 feet? But what about that bump? At first I took care that no one should ascend to a greater height than he could safely fall, however much the kite might want to take him higher. I tried to arrange that the lowest kite should act as a parachute in the event of the wind's dropping or the rope's breaking. This I tested while a good fat sand-bag was the occupant of the car. All I can say is that I am glad it was a sand-bag, and not a man. I thenceforward adopted a regular parachute, but the objection to this was that it wouldn't open until it had fallen about fifty feet; so if my man chanced to be up no more than that height, and an accident occurred, the parachute was not of much use, and even such a detail as a drop of fifty feet I didn't care to leave unprovided for. 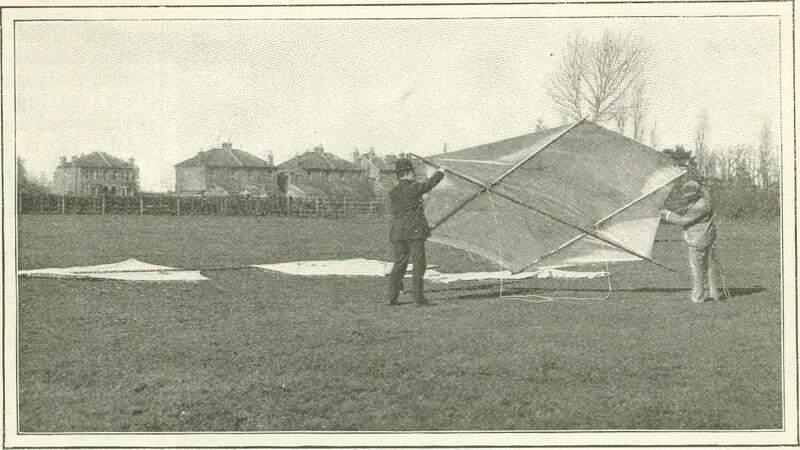 I next arranged a framework to the parachute to keep it permanently distended. Things were now going so well that I decided on a public exhibition, and I took the apparatus down to Ipswich to show to the savants of the British Association. There were many delays at starting. I had no experienced assistant. But when we got to business, the five kites did their work well. With the parachute spread above my head and a balloon-like car to stand in, I went up to the end of the tether, one hundred feet, numerous trips to this height were also made by others. Since then a number of satisfactory ascents have been made. Anybody can understand a kite's lifting in a strong wind, but to be really useful it ought to lift also in a calm. You may say that the whole principle of a kite depends upon wind; go for more than a few seconds – though in this time a man was actually lifted off the ground. Then I tied the rope to the back of a cab, and set that going, but the old horse was too lazy to get up speed. Next I fixed a kite directly to a horse. This did very well for one kite, but one was not enough to lift a man; so one day we arranged a number of kites in tandem, laid them on the ground, fixed the car in place, and laid out a rope about a thousand feet long, and attached it to the horse. In order to get the desired space, this rope was carried over an oak fence. When all was read, the signal was given, and off went the horse. Just as the kites were going to lift, I noticed something wrong with one of them. I shouted to stop the horse, but the groom did not hear. I ran forward to set the kite right if possible, but I only pulled it over so that it turned turtle and scraped along the ground. The other kites followed. I yelled out to stop the horse, but he became frightened and went tearing across the field, the car dragging and bumping along, and the kites continually catching in the ground and breaking. Soon the car came to the fence. There was a crash and a bang, some yards of fencing were hurled to the ground, and the horse, thus suddenly checked, turned a somersault and threw his rider like an arrow from a bow. Another day I very nearly experienced a new sensation. There was a set of kites flying low. A long light line was suspended from the cable, and the greater part of this lay entangled on the ground. I was busy trying to get it disentangled when, for some reason, up went the kite, up went my foot, and down I fell on my back. I had been dragged along thus for some yards, and was just about to be lifted a few hundred feet by my ankle, when a bystander rushed up and cut the cord. 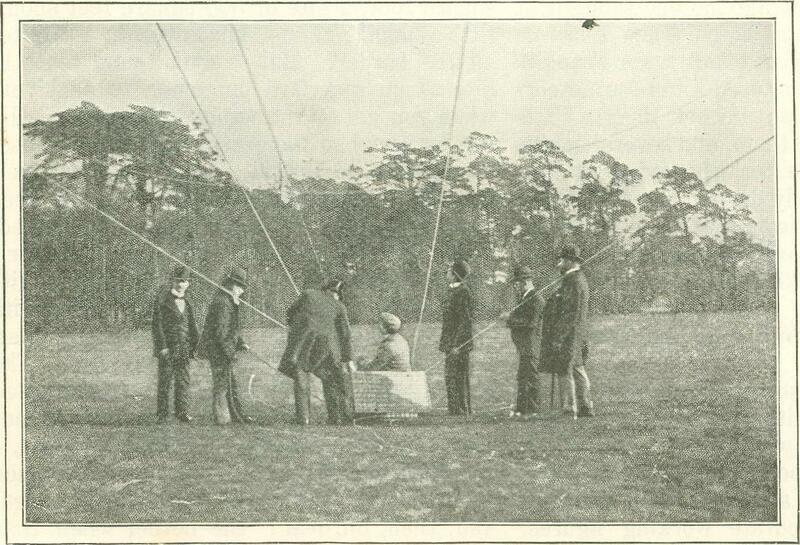 To sum up, we have, as the result of our experiments thus far, an apparatus that can lift a man several hundred feet. This can be done safely and surely, so as to not risk life or limb, and even without wind. As compared with a balloon equipment, this apparatus presents important advantages. 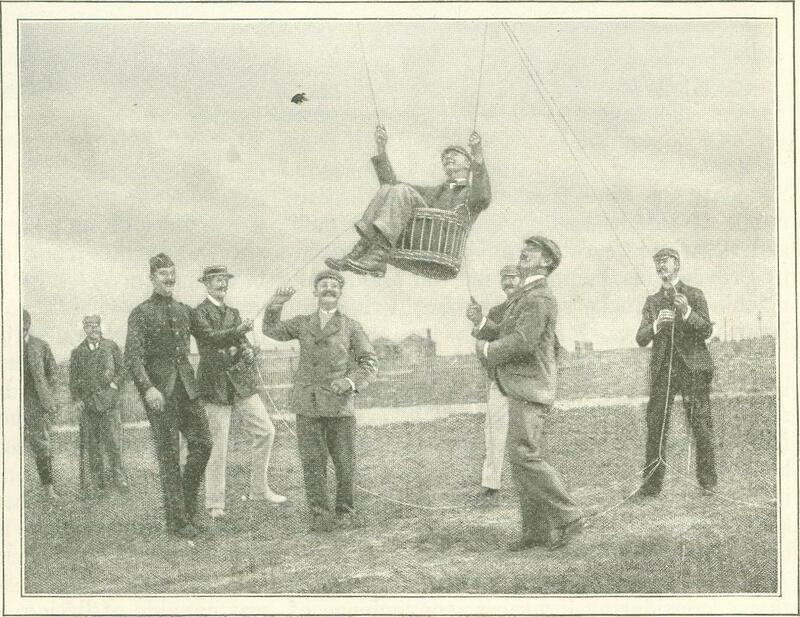 My entire “kiteage,” with ropes and all, weighs only a little over a hundred pounds, and can be carried by two men. When the order is given to ascend, I can unpack, set up, and send up the kites in about five minutes. I now require no manual labor to haul down, as the kites can be lowered by a gentle pull on the regulating line, which determines the angle they present to the wind. If the apparatus catches in trees and gets torn, it makes but little difference, and the injury is easily remedied. If it were a balloon to which the mishap befell, the gas would be lost, three wagon loads more would be required to refill it, and it would need very careful patching before it could be used again. 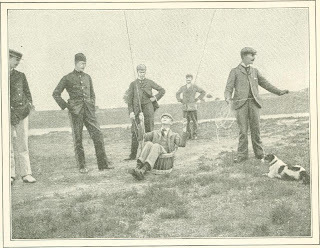 The same advantage would be held by the kite if a hostile bullet had penetrated either apparatus. And then, finally, the kite would involve, originally, probably not the twentieth part of the cost of the balloon; perhaps not a hundredth. Originally published in McClure’s Magazine in April of 1899.